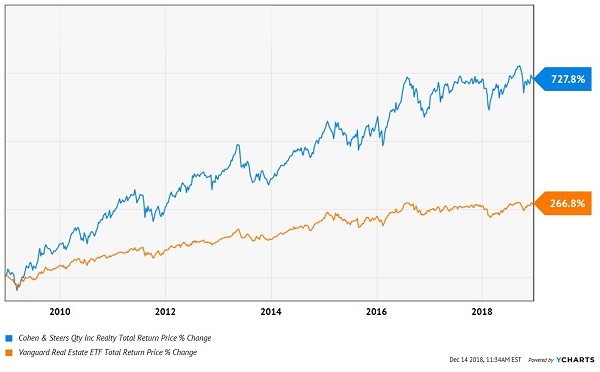 For those of you shaking your head at your portfolio’s low yield, you can actually 2X or 3X your portfolio’s yield and improve your upside potential to boot using this strategy. And it’s actually simpler than traditional stock picking. Many income investors have mistakenly parked their capital in “safe” consumer staples like General Mills (GIS), Kimberly-Clark (KMB) and Procter & Gamble (PG) in search of yield and security. Their money was safe, all right: their cash went nowhere – straight sideways – for the last five years! They’d have been better off “outsourcing” their dividend decisions to the great Mario Gabelli. His namesake Gabelli Dividend & Income Trust Fund (GDV) tends to pay around 6% or so (it yields 6.6% today). Mario’s dividends show up between the 14th and 24th of the month – every month – to the tune of $0.11 per share. Sounds like a sweet deal, right? His investors get the benefit of a legendary money mind along with his access to ideas and cheap money. And get paid monthly to boot. His secret sauce is his stock selection. Meanwhile our opportunity lies with the discount – the fact that we can wait patiently and buy it for one, to be specific. But as I write GDV trades at an 8.4% discount to the value of the stocks it holds. 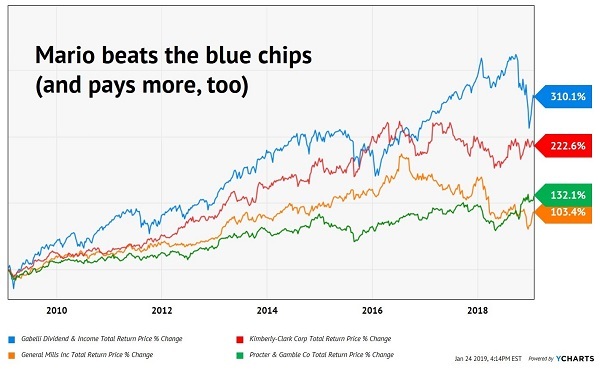 This means we can buy these blue chips for less than 92 cents on the dollar! Which means it also sells for far less than the management fee. It’s as if Gabelli’s paying us to own his fund. This deal shouldn’t be available, but it is from time-to-time thanks to the inefficiencies in CEF-land. Being able to snag Mario’s brilliance at a bargain is one example of our “CEF edge.” With $1.6 billion in assets, this particular fund is too small for big players to put money to work. Which works out perfectly for us. 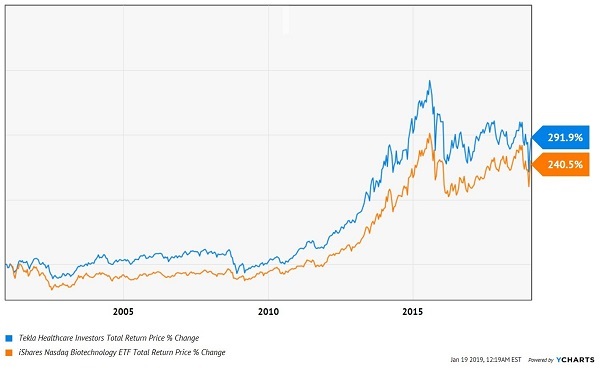 Another fund with a sustainable edge is the Cohen & Steers Infrastructure Fund (UTF), which holds stock and bonds in the top infrastructure and utility companies in the world. These smart businesses own and operate utilities, airports, toll roads, railroads, and other physical framework. This CEF regularly trades for a discount to NAV and has returned an outstanding 9.2% per year since inception – and shows no signs of slowing down. This 9.2% return on NAV is what powers an 8.4% dividend. Cohen & Steers Infrastructure’s managers are free to travel the globe in search of a bargain. One-quarter of the fund’s portfolio is invested in electric utilities. The rest is a mix ranging from toll roads to airports to pipelines and more. All of these, when bought at the right price, gush growing cash which the fund’s managers both reinvest and pays to us. Why don’t we just buy these issues directly and cut out the middleman? 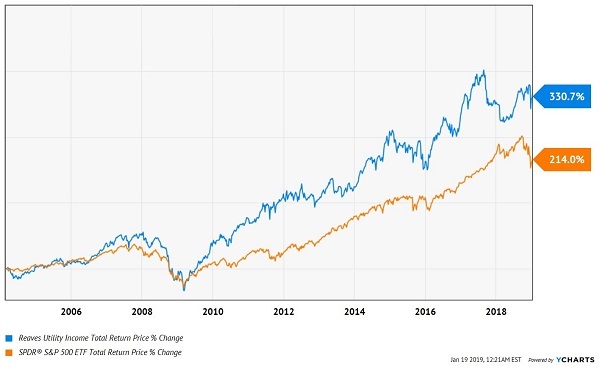 For starters, the fund also owns positions in preferred stock shares that pay higher yields, and these generally aren’t available to individual investors like you and me. Plus, the fund gets to use leverage. Not only are we grabbing this collection of assets for just 94 cents on the dollar for an 8.4% annual yield with upside, but we’re also putting ourselves in line for future dividend hikes. Cohen & Steers Infrastructure’s management team recently raised its monthly distribution nearly 16% (yes, you read right, from $0.134 to $0.155 per month). That’s a more than generous gesture, rarely seen in the CEF world. Plus, it’s not unique for this fantastic fund. 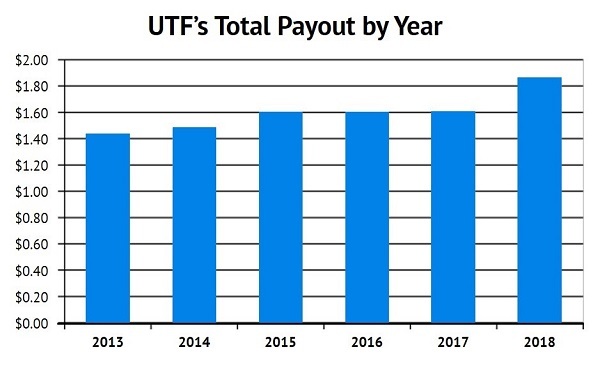 This is the third big dividend increase since 2013! The best time to buy is right now. As I write, RQI trades at a ridiculous 8.8% discount to NAV. That sets us up for price upside as RQI’s discount window slams shut. 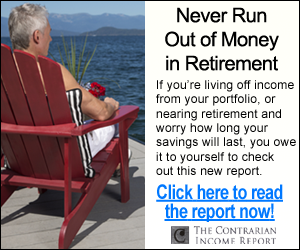 You can build a great retirement portfolio using CEFs alone. With smart selection and purchase timing, you can collect 7% to 8% yearly dividends that are 100% powered by the fund’s annual profits. Whether you choose to buy bonds, stocks or something in-between, there are excellent performers that you can purchase for 90 or 95 cents on the dollar. Smart CEFs like these are your “dividend lifeboats” when the markets get rough. That’s because their massive cash payouts give you more of your profits in cash, rather than here today, gone tomorrow paper gains. And by focusing on CEFs and also individual stock and bond funds with steady cash flow, you can make sure your nest egg stays intact—and grows for the future. 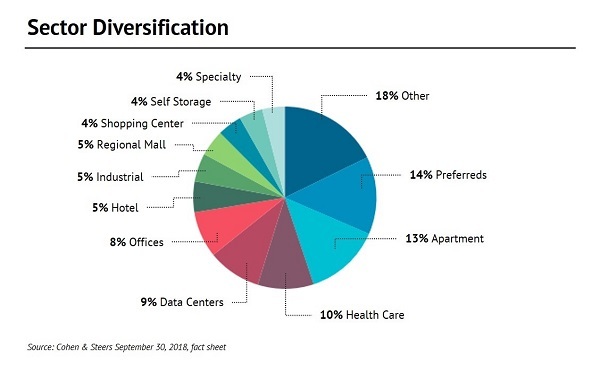 I’ve got 20 more dividend plays to give you—all REITs, CEFs and secure cash flowing funds and stocks—that fit this description to a T. Each one taps into the same kinds of megatrends that have benefitted hall-of-fame CEFs. I’m talking 8% cash payouts, on average—enough to let you retire on dividends alone with a $500k nest egg, thanks to the $40,000 yearly income stream these defensive superstars give you. That’s why I call this my “8% No Withdrawal Portfolio.” I can’t wait to show it to you. 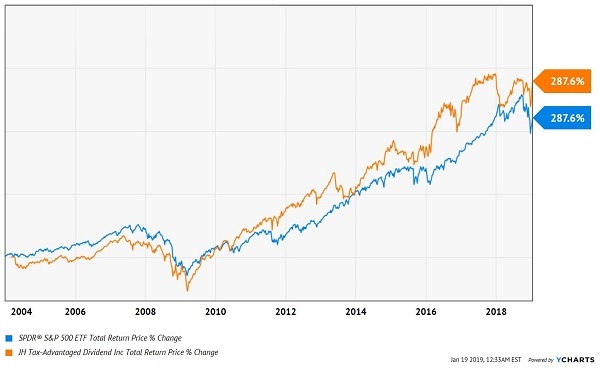 The newest issue of my Contrarian Income Report newsletter will publish the first week of February, with fresh updates on the 20 stocks and funds in the portfolio. My research will hand our savvy CIR members massive yields up to 12%! I want to send all 20 of these cash-rich plays your way, too. Don’t miss out. 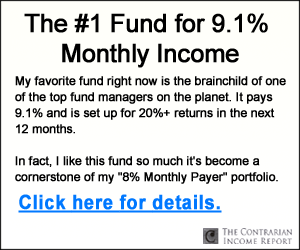 Click here and I’ll give you INSTANT access to my 8% No Withdrawal portfolio and the latest issue of Contrarian Income Report, with its 20 powerhouse income plays (yields up to 12%).